Pizza Extravaganza… family pizza night. Since our children have grown it is hard to get everybody together in order to share a meal. Well, this weekend we did have three of our children at home plus a boyfriend thrown in, all waiting to make pizza. This is a favorite meal at our house. But everybody has their own taste when it comes to toppings that they like on their pizza, just like I am sure it is in every family. So I decided that we would all make our own little pizzas, that way everybody would be happy. I found the recipe for the pizza crust in the Taste of Home 2009 Annual Recipe cookbook. As I have stated in previous blog posts I am all about the bread. So, of course, nothing but made from scratch pizza dough will do for my home made pizza. 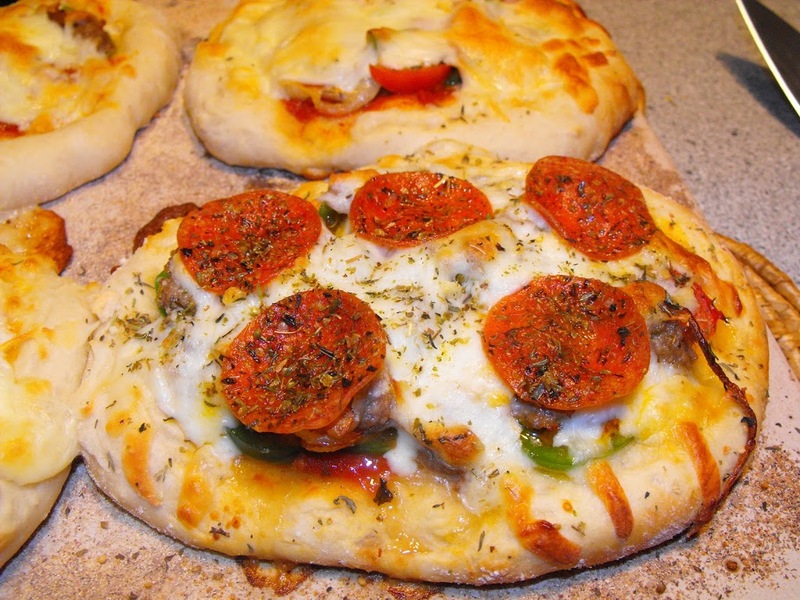 This pizza crust was soft and chewy and quite easy to make. I know that it takes a little longer to make the pizza when you make your own crust from scratch but in my book, I think that it is worth the extra time and effort. We had a variety of toppings to choose from. Our favorites are Italian sausage, pepperoni, onions, green peppers, and the list goes on. I did saute the onions and I had cherry tomatoes that I sauteed in olive oil for about 20 seconds. I wanted to have fresh basil, but it was raining all day so I was not able to get to the garden, so I had to settle for some basil that had been drying in the house for a couple of weeks. Even though the basil had been dried it gave the pizza a wonderful flavor. We all had a wonderful time making the pizza, but the best part of all was eating the homemade pizza! In a large mixing bowl, dissolve yeast in a warm water. Add oil, sugar, salt, and 1 cup of flour. Beat until smooth. Stir in enough remaining flour to form a soft dough. Turn onto a floured surface; knead until smooth and elastic, about 6 to 8 minutes. 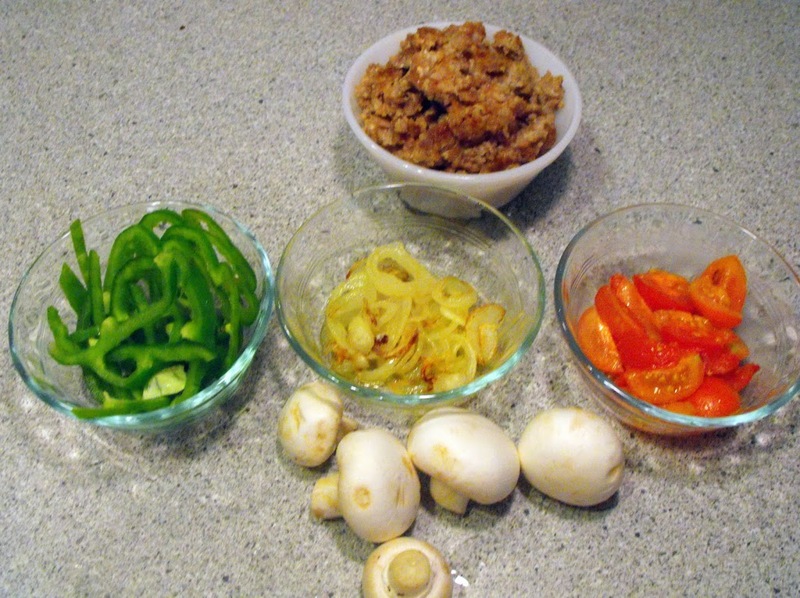 Place in a bowl coated with cooking spray, turning once to coat the top. Cover and let rise in a warm place until doubled, about 1 hour. Punch dough down; divide in half. Roll each portion into a 13-inch circle. Transfer to two 14 inch pizza pans. Cover and let rest for 10 minutes. Spoon your favorite pizza sauce over crust and follow with favorite toppings. Bake in 450-degree oven for about 15 to 20 minutes until the crust and cheese have browned. 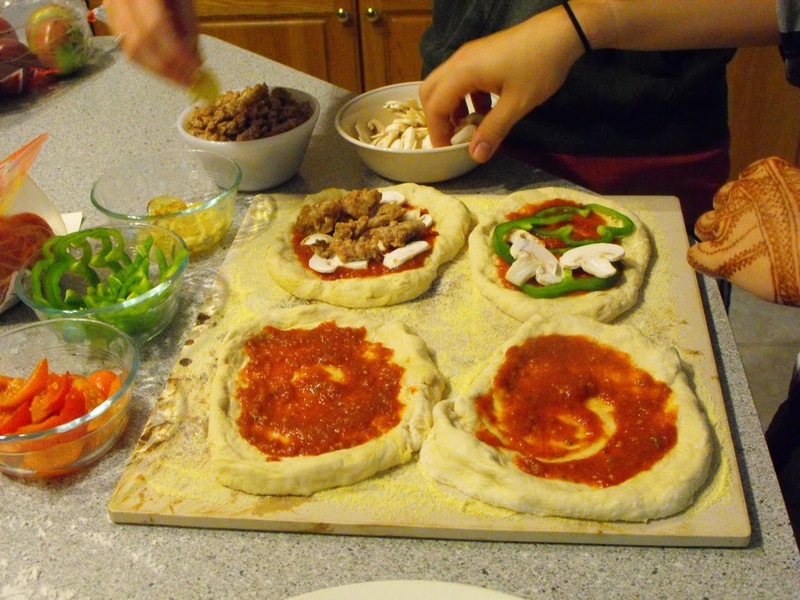 Notes: I made a double recipe of the dough and we made the individual size pizzas. I patted the dough out on the baking stone (pat it out on the pan will be much easier than rolling it and trying to move it to a pan) and did not let it rest, everybody was anxious to make their pizzas and this worked out fine for us. Also When I bake the pizza I like a lower heat around 400 degrees. Homemade pizza is the best! They look delicious. This is wonderful, Dawn! Nothing like getting together with the whole family and everyone pitching in! 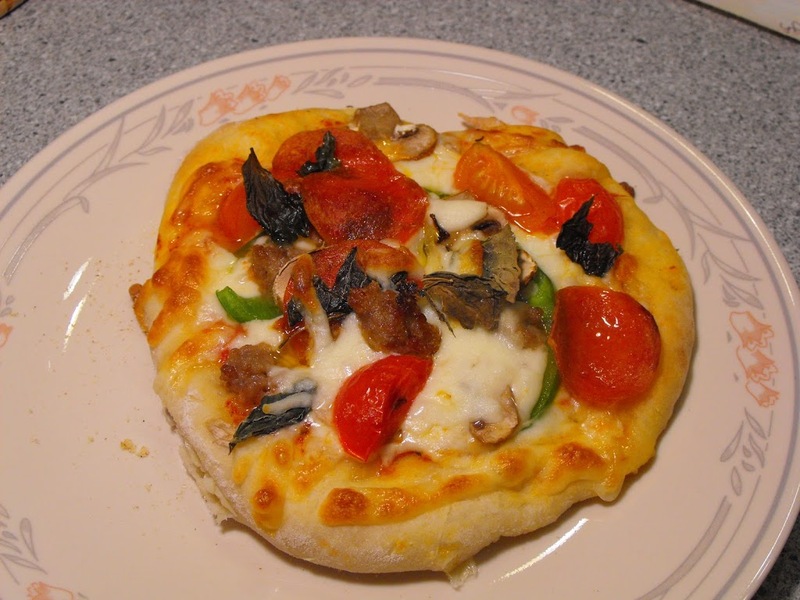 I have made individual pizzas before but always with a pre~made crust…I have to try your recipe for dough. Thanks so much for stopping by my blog! I’m glad you decided to start yours…I’m sure you have a lot to share! I could actually have pizza every day and never get sick of it! Looks delicious!